How often do you think about the health of your eyes? Do you care for them as you do the rest of your body? This National Eye Exam Month, we’re reminded that we need regular eye check-ups, just like regular physicals and screenings, to keep our eyes healthy and optimally functioning. And for some people, a routine eye exam could even be a vision saver. The Centers for Disease Control and Prevention (CDC) describes a laundry list of disorders that can affect the eyes. Some are primarily associated with aging, such as macular degeneration, cataracts, diabetic retinopathy and glaucoma. Diseases like these are the leading causes of blindness and low vision in the United States. All of them require close management by a qualified eye care professional. And, of course, regular eye exams are critical. Eye disorders that get a little less attention but are just as important to the nation’s collective eyesight are the refractive errors, including myopia, hyperopia, astigmatism and presbyopia. These disorders are the most common eye problems affecting our country. In fact, recent studies by the National Eye Institute concluded that about 11 million Americans 12 and older could improve their vision with proper correction of their refractive conditions. They can be detected during a routine eye exam. Myopia is more commonly known as nearsightedness. With myopia, objects that are up close, or near, can be seen clearly, but objects further away are blurry. Hyperopia, or farsightedness, is a little more complex than just the opposite of myopia. While in its truest sense near objects are blurry and objects further away are clearer, hyperopia can express differently in different people. For some, objects at any distance can be out of focus. With astigmatism, the eye does not focus light properly on the retina. That’s the light-sensitive patch of tissue at the back of the eye that converts light into the messages that get sent through the optic nerve to the brain. Without the proper focus, images look blurry and can even seem stretched out. Presbyopia occurs as people age. In this case, the eye’s crystalline lens can no longer change shape well enough to focus clearly on near objects. That’s why people in their 40s and 50s start holding out that newspaper in order to read it! To stay ahead of all these disorders and maintain good eye health, don’t forget to see to your eyes. 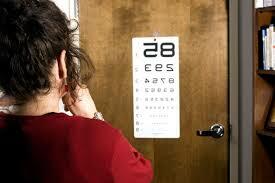 An ophthalmic exam is nothing to fear.2 How often should you go? Well, for adults between 20 and 39, the recommendation is to have a complete eye exam every five to ten years. Adults over 40 need more frequent exams. Those between 40 and 54 should be seen every two to four years. Those between 55 and 64 should be seen every one to three years, and those age 65 and older need exams every one to two years. Adults of any age who wear contact lenses should be examined yearly.2 Anyone with symptoms or risk factors for eye disease should follow their doctor’s recommendations. If you’re interested in eye health and would like to know more, check out this web page. It has links to information about many eye disorders and treatments. Just don’t forget how important your eyes are to your overall health and wellbeing. Happy National Eye Exam Month!